Evers-Williams delivering remarks during the christening ceremony for US Navy ship Medgar Evers, 2011. Myrlie Louise Evers–Williams (née Beasley; born March 17, 1933) is an American civil rights activist and journalist who worked for over three decades to seek justice for the murder of her civil rights activist husband Medgar Evers in 1963. She was also chairwoman of the NAACP, and published several books on topics related to civil rights and her husband’s legacy. On January 21, 2013, she delivered the invocation at the second inauguration of Barack Obama. Evers was born Myrlie Louise Beasley on March 17, 1933, in her maternal grandmother’s home in Vicksburg, Mississippi, the daughter of James Van Dyke Beasley, a delivery man, and Mildred Washington Beasley, who was 16 years old. Myrlie’s parents separated when she just a year old; her mother left Vicksburg and had decided that Myrlie was too young to bring with her. Since her maternal grandmother worked all day in service, leaving her no time to raise a child, Myrlie was raised by her paternal grandmother, Annie McCain Beasley, and an aunt, Myrlie Beasley Polk. Both women were respected school teachers and they inspired her to follow in their footsteps. Myrlie attended the Magnolia school, took piano lessons, and performed songs, piano pieces or recited poetry at school, in church, and at local clubs. Myrlie graduated from Magnolia High School (Bowman High School) in Vicksburg in 1950. During her years in high school, Myrlie was also a member of the Chansonettes, a girls’ vocal group from Mount Heroden Baptist Church in Vicksburg. In 1950, Myrlie enrolled at Alcorn A&M College, one of the few colleges in the state that accepted African American students, as an education major intending to minor in music. Myrlie is also a member of Delta Sigma Theta sorority. An incident on her first day on campus altered her plans; Myrlie met and fell in love with Medgar Evers, a World War II veteran several years her senior. The couple married on Christmas Eve of 1951. They would move to Mound Bayou, have three children, Darrell Kenyatta, Reena Denise, and James Van Dyke. In Mound Bayou, Myrlie worked as a secretary at the Magnolia Mutual Life Insurance Company. When Medgar Evers became the Mississippi field secretary for the National Association for the Advancement of Colored People (NAACP) in 1954, Myrlie worked alongside him. Myrlie became his secretary and together they organized voter registration drives and civil rights demonstrations. She assisted him as he strove to end the practice of racial segregation in schools and other public facilities and campaigned for voting rights as many African Americans were denied this right in the South. For more than a decade, the Everses fought for voting rights, equal access to public accommodations, the desegregation of the University of Mississippi, and for equal rights in general for Mississippi's African American population. As prominent civil rights leaders in Mississippi, the Everses became high-profile targets for pro-segregationist violence and terrorism. In 1962, their home in Jackson, Mississippi, was firebombed in reaction to an organized boycott of downtown Jackson’s white merchants. The family had been threatened, and Evers targeted by the Ku Klux Klan. After Byron De La Beckwith's second trial in 1967, she moved with her children to Claremont, California, and emerged as a civil rights activist in her own right. She earned her Bachelor of Arts in sociology from Pomona College. She spoke on behalf of the NAACP and in 1967 co-wrote For Us, the Living, which chronicled her late husband's life and work. She also made two unsuccessful bids for U.S. Congress. From 1968 to 1970, Evers was the director of planning at the center for Educational Opportunity for the Claremont Colleges. From 1973 to 1975, Evers was the vice-president for advertising and publicity at the New York-based advertising firm, Seligman and Lapz. In 1975, she moved to Los Angeles to become the national director for community affairs for the Atlantic Richfield Company (ARCO). At ARCO she was responsible for developing and managing all the corporate programs. This included overseeing funding for community projects, outreach programs, public and private partnership programs and staff development. She helped secure money for many organizations such as the National Woman’s Educational Fund, and worked with a group that provided meals to the poor and homeless. Myrlie Evers-Williams continued to explore ways to serve her community and to work with the NAACP. Los Angeles mayor Tom Bradley appointed her to the Board of Public Works as a commissioner in 1987. Evers-Williams was the first black woman to serve as a commissioner on the board, a position she held for 8 years. Evers-Williams also joined the board of the NAACP. By the mid-1990s, the prestigious organization was going through a difficult period marked by scandal and economic problems. Evers-Williams decided that the best way to help the organization was to run for chairperson of the board of directors. She won the position in 1995, just after her second husband’s death due to prostate cancer. As chairperson of the NAACP, Evers-Williams worked to restore the tarnished image of the organization. She also helped improve its financial status, raising enough funds to eliminate its debt. Evers-Williams received many honors for her work, including being named Woman of the Year by Ms. Magazine. With the organization financially stable, she decided to not seek re-election as chairperson in 1998. In that same year, she was awarded the NAACP's Spingarn Medal. In 2009, Evers-Williams received the National Freedom Award from the National Civil Rights Museum in Memphis, Tennessee. Ebony magazine named Evers-Williams as one of the "100 Most Fascinating Black Women of the 20th Century." She has received seven honorary doctorates. In February 2012, Alcorn State University in Lorman, Mississippi announced that Evers-Williams would be serving as a distinguished scholar-in-residence. On January 21, 2013, Evers-Williams delivered the invocation at the second inauguration of Barack Obama. She was the first woman and the first layperson to deliver the invocation at a presidential inauguration. In 1976, Evers married Walter Williams, a longshoreman and civil rights and union activist who had studied Evers and his work. They moved to Bend, Oregon in 1989. Williams died in 1995. Whoopi Goldberg played Evers-Williams in the feature film historical drama Ghosts of Mississippi (1996). In 2013, she was portrayed by Gloria Reuben in the Lifetime movie Betty and Coretta (uncredited). 1 2 3 4 5 6 7 8 Padgett, John. "MWP: Myrlie Evers-Williams". University of Mississippi. Retrieved October 20, 2011. 1 2 3 4 5 6 7 Goldsworthy, Joan. "Gale - Free Resources - Black History - Biographies - Myrlie Evers-Williams". Gale. Retrieved November 22, 2011. 1 2 3 4 5 6 7 8 9 "Myrlie Evers-Williams Biography - Facts, Birthday, Life Story - Biography.com". Famous Biographies & TV Shows - Biography.com. A&E Television Networks. Retrieved November 22, 2011. ↑ Davis, Merlene. "Merlene Davis: Myrlie Evers-Williams doesn't want us to forget". Kentucky.com. Retrieved 22 November 2011. ↑ Jessie Carney Smith; VNR Verlag für die Deutsche Wirtschaft (1996). Notable Black American Women: book II. books.google.com. p. 208. ISBN 978-0810391772. ↑ University of Virginia (June 24, 2013). "Speakers and Guests Bios". virginia.edu. ↑ Melinda Blau (Director) (February 15, 1999). "A life of victories and hardshipst: 'Watch Me Fly'". First Chapters. CNN. Retrieved January 20, 2013. ↑ Dake, Lauren (October 26, 2009). "Civil rights leader to be honored; Myrlie Evers-Williams, who makes a home in Bend, 'never gave up'". The Bulletin. Bend, OR. Retrieved January 20, 2013. ↑ "Myrlie Evers-Williams: Visionary Videos". National Visionary Leadership Project: African American History. Retrieved January 20, 2013. ↑ Mitchell, Jerry (February 1, 2012). "Myrlie Evers-Williams is coming home to Mississippi". Clarion-Ledger. Retrieved January 20, 2013. ↑ "Bend resident Myrlie Evers-Williams gets historic invite: Widow of slain civil rights leader to give inaugural invocation". KTVZ.com, Central Oregon's News Leader. January 9, 2013. Retrieved January 20, 2013. ↑ Debbie Elliott (January 21, 2013). "Myrlie Evers-Williams To Deliver Inaugural Invocation". npr.org. ↑ Deborah Barfield Berry, "Evers-Williams pays homage to 'those who came before'", USA Today, January 21, 2013. Accessed January 24, 2013. 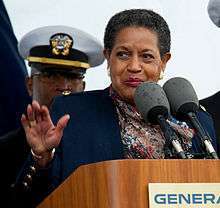 ↑ "Myrlie Evers-Williams returns to Mississippi as more than a civil rights widow", Washington Post, June 4, 2013. Wikimedia Commons has media related to Myrlie Evers-Williams. "Pursuing the Past -- Myrlie Evers-Williams". Online NewsHour. PBS. April 23, 2002. Retrieved January 20, 2013.